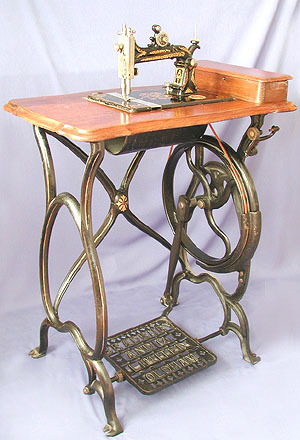 Antique sewing machine - Bradbury 1A treadle (1). The Bradbury 1A was available throughout the 1870s. This particular example of the Howe - inspired machine came complete with a relief brass medallion featuring the Wellington trade mark, somewhat mimicking those found on Howe originals. For a close up of machine head, see here.